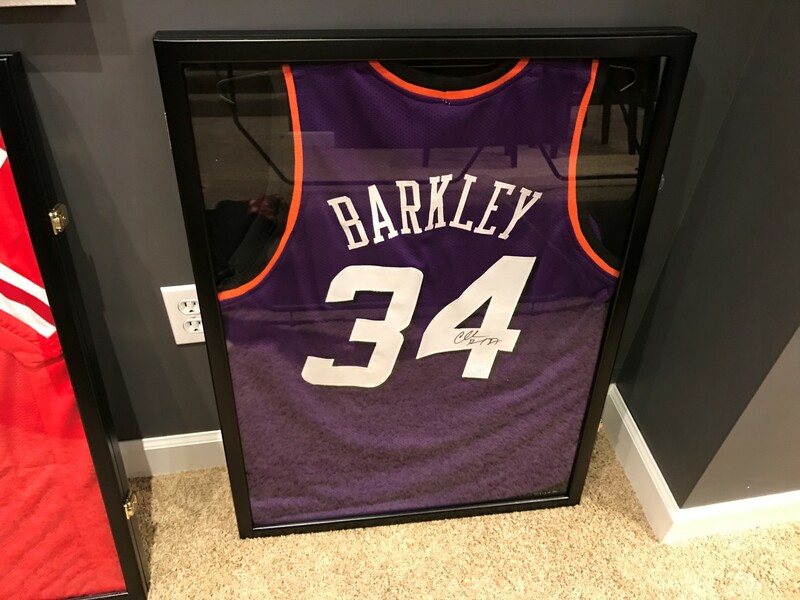 If you’re into sports and have a basement to decorate, I’m sure one of the things you’ve thought about doing is putting up some framed jerseys of your favorite sports stars. I’d been wanting to do this for a long time in my basement, and this week I finally got around to it by ordering a bunch of stuff off Amazon and Ebay. I’d bought a couple jersey frames in past but the ones I bought now are far superior to those. There are some similar options are that a little deeper or have slightly different dimensions, but these were the ones I thought had the best bang for the buck. 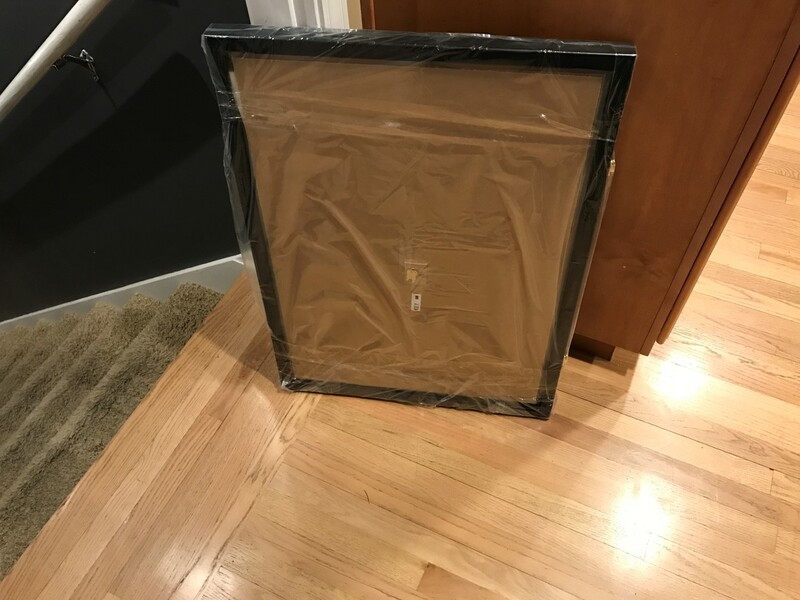 They arrived in two different bundles, one of three frames and the other with two. The frames are fairly heavy so it’s a good thing they were split up, if all 5 were together it would have been pretty heavy to lift. Once I got them separated, it was time to start putting some jerseys in them. I had 5 different jerseys I had gotten off Ebay, two basketball, one football, one hockey, and one baseball. The basketball ones were really easy to do. 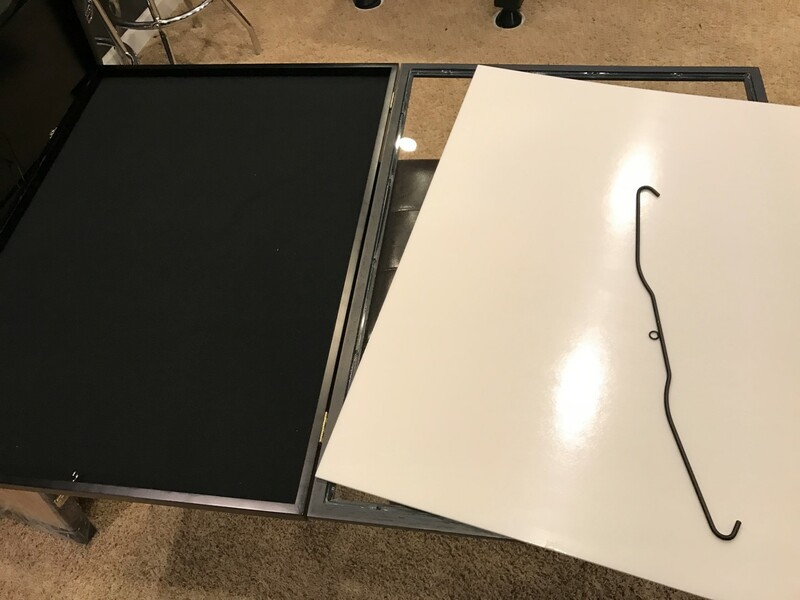 The case comes with a black hangar to do basketball jerseys with, so it was as simple as putting the jersey on the hangar and then putting it on the hook inside the frame. After hanging you’ll probably have to tuck in the jersey a little bit (depending on the size and sport). For the basketball one I just had to fold the jersey a little behind. The football one though was a little trickier but still pretty easy. The frame comes with a white cardboard insert that you put the football jersey around. Once you have it over the cardboard, you can pin it to tighten it up if you want (pins are included) or you can just put it in the case and squeeze the fabric in. The hardest part it just keeping all the fabric out of sides of the case when you’re trying to close it, if any fabric isn’t inside the case the case will have a hard time closing. Once the jerseys were installed inside the cases, it was now time to hang them on the wall. Luckily, the cases come with three hangers preinstalled on the back to make it easy. No screws are included though for putting it on the wall, you’ll have to provide those yourself. I would recommend hanging these on a stud when possible, the heavy weight will make the nail/screw sag after a while if you don’t. The frame itself is really nice, it’s not an el cheapo product that you sometimes get with frames. 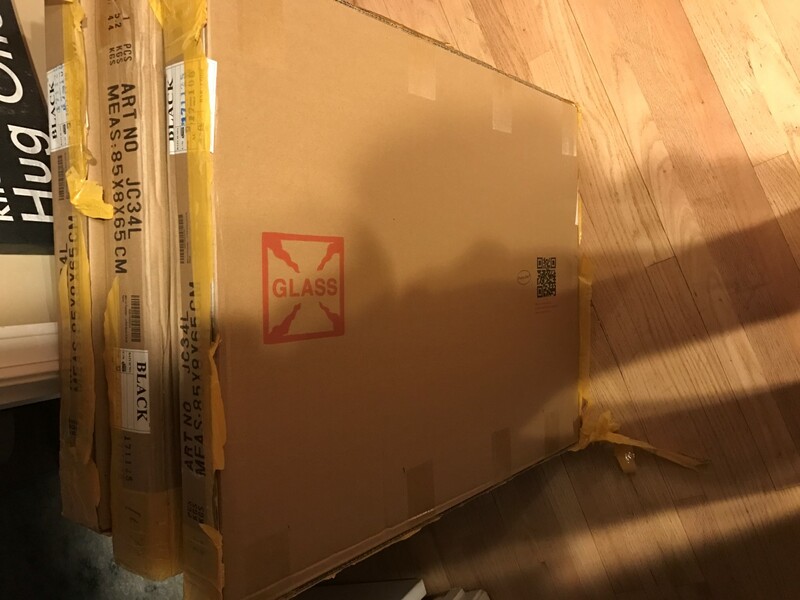 Evidently the front is real glass, or at least the box says it is. Most of these frames usually come with Plexiglas, so glass is a step up. I couldn’t really tell from touching it, all the edges that would give it away are hidden in the frame. 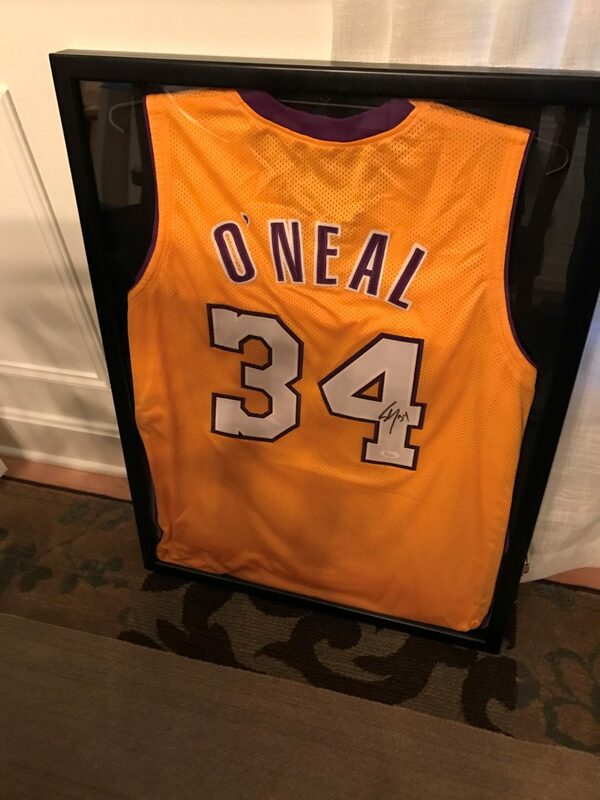 The back of the frame is a nice black velvety fabric that absorbs light very well, giving the jersey good contrast in the frame. Whether you get this frame or some other frame, having a background that is light absorbent helps a lot. 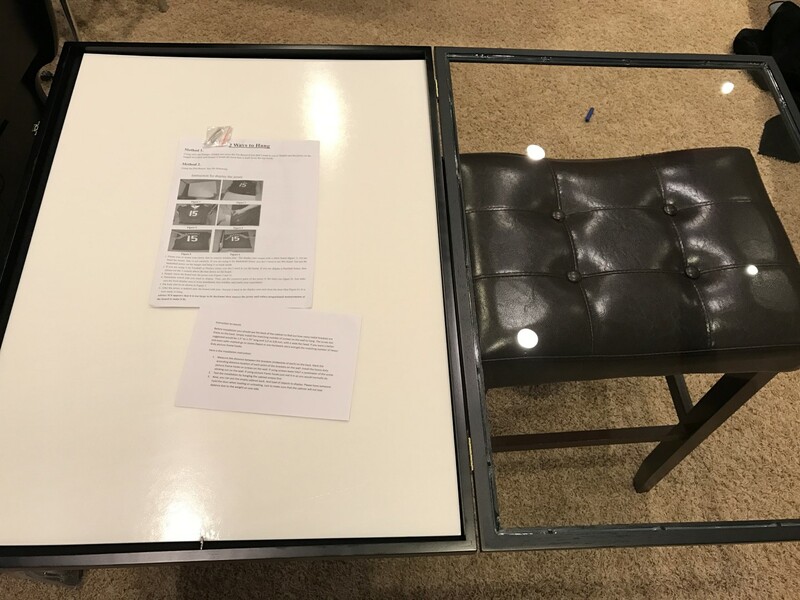 Basically, the whole point of this article was that you can save yourself a ton of money by buying this frame or one like it from Amazon or another retailer. Then just get a jersey off Ebay of your favorite star. If you go to a local sports store, they’ll probably charge you double, triple, or quadruple what doing this would cost. Save some money, do it yourself. Then if you want to change out the jersey at some later point it’ll be 10 times easier as well.